As a life/relationship coach, I’ve had the privilege of working with some of the most respectable people you’d ever want to meet. These are not rapists on skid row or crack-peddling prostitutes. They are accomplished doctors, ministers, missionaries, businessmen and women, home-room mothers, chancel choir directors, and so on. But regardless of how upstanding we can appear in our public roles, we’re never exempt from downward-spiraling behaviors. Part of my coaching with individuals and couples is to help them recognize specific thought patterns that opened the door for their once-fanciful dream to morph into their most recent nightmare. 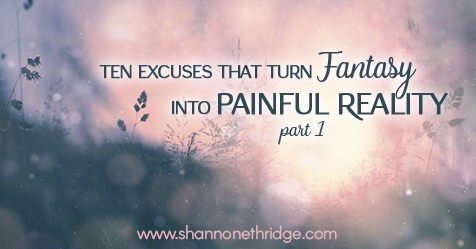 Fantasies don’t become realities without a little pre-meditation and selfish action on our part, so let’s look at ten excuses that can lead us toward a moment of pleasure, but a lifetime of pain. 1. I deserve time off for good behavior. Time off for good behavior is for prisoners on parole. Marriage isn’t a prison but a privilege. I doubt that time off for good behavior was part of the vows you took or the marriage contract you signed, so don’t use this lame excuse to justify behavior that will ultimately bring great shame and humiliation to you, your spouse, and your family for generations to come. 2. It’s now or never . . .My daddy always told me that if someone is looking to strike a business deal with you, and it’s a “now or never” option, always choose never. It’s not just a good policy in business deals, but also in avoiding relational monkey business. 3. As long as we’re here . . .As long as we’re at home in our normal surroundings, going about our normal routine doesn’t seem like such a challenge. But when we take a little trip and step into a new place, out of eyesight or earshot of friends and family, we can quickly lose our relational bearings. That’s why business travelers have a particularly challenging lifestyle, and also why vacationing alone or without a spouse can open the door to compromise quickly. Make sure to keep your guard way up whenever you’re away from home. 4. Acting out this fantasy will make me feel more desirable.For a moment, perhaps. Although chances are, the fantasy will turn out much better than the reality. But even if it does float your boat big time, then what? You might come home feeling a little sexier for the few hours/days that your head remains in the clouds, but reality sets in like a bullet through the brain. If you want to avoid that kind of trauma, avoid the tryst. 5. No one has to know.You’re right. No one has to know; however, spouses (and even kids) have an uncanny knack at figuring these things out. But even if you manage to pull the wool over other people’s eyes, you’ll know. And you ruminating over it (positively or negatively) can constantly draw your attention away from where it needs to be-on your spouse, children, house, job, church, etc. Allowing a fantasy to become a reality is like renting out your brain to the person involved. And like renters from hell, sometimes they refuse to leave when you’re ready to have your brain back!